Watercolor Works: Long Time - No See! At left is a miniature painting I just created last week for part of my new miniature series. It is framed in gold and measures (with frame) 6 x 8 inches. $65.00 – bring a lunch. 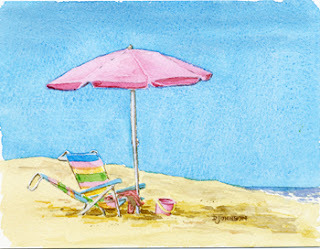 This workshop is for those who are new to watercolor. We will set up our palettes together, discuss tools and materials, learn the basic washes and brush strokes, and practice together each step of the way. In the afternoon, we will practice techniques taught in the morning session, and create a small painting together. Students will develop a a better understanding of the exciting medium of watercolor. Pre-registration and payment is required to hold your spot. Space is limited, so register online or print registration form from website and mail to Debbie. This would make a great gift for someone who would like to get started in watercolor! I will be adding a new Blog Lesson just after Thanksgiving. Hope you have a great holiday!